There’s little as inviting on a hot summer day as a lush, green lawn. To make sure your yard is ready for summertime fun, invest a little time and attention into it this spring. “As seasonal temperatures rise across the country, we’re entering prime lawn growing season and the perfect time to so some basic maintenance,” says Bryan Ostlund of Grass Seed USA. 1. Rake. Raking a lawn removes dead grass, leftover winter leaves and other debris, allowing you to control thatch and see bare or worn areas that need attention. It also permits new, young grass to grow more easily and increases soil contact when seeding. 2. Test your soil. Good soil is one of the essentials of a healthy lawn. A soil test is simple and inexpensive (do-it-yourself kits are available at local garden centers), and it provides valuable information about current pH levels. Simple amendments like lime or sulfur can be added to neutralize overly acidic or alkaline soil and help grass thrive. 3. Aerate. Older or heavily trafficked lawns can suffer from soil compaction. A core aerator with hollow tines will pull small plugs of soil out of the ground, allowing increased movement of water, nutrients and oxygen. Aeration can also increase the soil contact with new seeds and promote new growth. You can rent an aerator or hire a professional to do the work for you. 4. Seed. Spring offers optimal conditions for establishing new lawns or repairing thin or bare patches in existing lawns, and there is ample time for grass to grow healthy and strong before summer. Turf specialists at a garden store or local university extension office can help select the right seed for your area and usage, pointing you toward the seed closest to existing grass or suggesting alternatives for problem areas. After seeding, water lightly but regularly, keeping the reseeded areas damp until the new grass grows in. A starter fertilizer may be used, but isn’t necessary. 5. Control weeds. Healthy lawns essentially control weeds by squeezing them out. However, if crabgrass or dandelions invade, herbicides may help. Consult a garden specialist about which herbicide is right for your lawn and how to use it. Applying a pre-emergent herbicide in the spring before weed grass emerges can reduce problems down the line. If you’ve applied seed, keep in mind that herbicides can kill it, so use a product that will not affect new growth. For dandelions, digging them up is often effective, but a broadleaf herbicide may be applied. 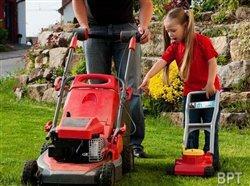 More lawn care tips can be found at www.weseedamerica.com. “Investing even a little time now to seed or repair your lawn will pay off in the months to come and ensure you’re ready for summer,” says Ostlund.